Group of American PWs at Stalag IV-B, Mühlberg (Elbe), Germany. The majority of these prisoners were captured during the German counteroffensive in the Bulge (Belgium). The camp held approximately 16,000 prisoners, including Americans, British (+ Commonwealth), and others interned after the invasion of the Low Countries in May-June 1940. General: The medical care of Recovered Allied Military Personnel (RAMP) is the responsibility of the British and United States Medical Services. Examination of the Communications Zone and 21st Army Group Hospitalization Program indicates a potential shortage of fixed hospitalization facilities to provide satisfactory medical care for the estimated number of RAMPs during the period 1 February 1945 – 1 July 1945, unless appropriate action is taken designed to reduce overall US/British requirements. Object: This directive is written with the view of reducing the anticipated commitments on military medical services and obtaining the maximum assistance possible from the Allied Nations concerned. A “stay-put” policy must apply to all Allied military personnel uncovered in German Hospitals in the present continuing operation, the tactical situation permitting, until such time as they may be taken over by their respective Allied Governments. Allied Nations concerned will render the maximum medical assistance possible and expeditiously evacuate their own recovered personnel, thus relieving British and United States medical services of this commitment. The French – Polish – Belgian – and Dutch authorities have earmarked reception facilities and will attempt to provide a limited number of medical personnel on request from Army Group through “PWX” channels. No Soviet, Yugoslav, and Italian hospital facilities exist for sick and wounded nationals of those countries uncovered in German Military Hospitals by our advancing forces. It is, therefore, imperative that such Recovered Allied Military Personnel should be held in the uncovered Hospitals, the tactical situation permitting, until they can be evacuated or repatriated. Recovered Allied Medical Personnel will be used to the maximum extent practicable in the hospitalization and evacuation of RAMPs. The Repatriation Regulations covering the evacuation – disposition – and physical examination of all World War Two Prisoners of War was the US War Department “Procedure, Return, and Reassignment of Recovered Personnel”, dated April 21, 1945 (revised August 17, 1945). The War Department procedure specifically applicable to European Theater PWs was entitled “Repatriation, Recovery, and Rehabilitation of American PWs in Europe”, dated October 3, 1944, which was the basis for discussion of ETO PWs in the April 21, 1945 procedure. These WD Regulations were implemented in the European Theater of Operations by the Supreme Headquarters Allied Expeditionary Force (SHAEF) procedure entitled “ECLIPSE – Memorandum No. 8”, dated March 19, 1945. This Anglo-American instruction was further refined by the US Army European Theater of Operations Standard Operating Procedure No. 58 (ETO SOP No. 58), dated April 3, 1945. The War Department procedures assigned primary responsibility for the evacuation of American, British, and other Allied PWs interned more than 60 days to Theater Commanders in SHAEF and the United States Army. These Prisoners of War were officially designated “Recovered Allied Military Personnel” (RAMP). The above instructions did not apply to those PWs interned less than 60 days. The primary directive pertaining to this group, mostly evaders and escapees, was the War Department procedure entitled “Military Personnel Escaped From Enemy Territory”, dated July 11, 1944, and “Publicity in Connection With Escaped, Liberated, or Repatriated Prisoners of War, to Include Evaders of Capture”, dated March 29, 1945. These instructions emphasized security, prohibiting the release of intelligence information obtained by evaders and escapees to other than military sources. The Western Allies, including the Soviet Government, and Germany concluded the ”Standfast Agreement”, signed on April 22, 1945 in which American PWs would no longer be transferred further into Germany with each Allied advance, but would remain in their camps, (difficult to implement –ed) with the understanding that they would not be returned to active duty and combat once recovered! Allied PWs opening Relief Packages supplied by the national Red Cross and Relief organizations in Allied countries. “ECLIPSE Memorandum No. 8” – outlined the procedures to be followed by the liberating Army before the Prisoners of War were to be evacuated from their prison camps. The liberating forces were to prepare a roster of all PWs in the camps they overran, and an identification card to each newly liberated PW. Former Prisoners of War were also encouraged to write home as soon as possible, although mail was to be censored to prevent the release of unauthorized casualty or intelligence information. Memorandum No. 8 further provided that sick and wounded PWs would have first priority for evacuation from forward areas. All were to be evacuated by air, or if air was not available, by train. “ETO SOP No. 58” – outlined the procedures for ex-PWs once they were evacuated from the battlefield. Former Prisoners of War were to be supplied with food, clothing, bedding, and toilet articles at the Reception Camps, and then transported as soon as possible after receiving these articles to the Embarkation Staging Areas. Intelligence screening was one of the primary functions to be performed at the staging area. This consisted of interviews designed to determine if there were any Nazi spies or sympathizers among the liberated PWs. Other functions to be performed at the staging area included establishing a personnel record on each former Prisoner of War and providing him with advance or partial payments until final payment could be arranged. ETO SOP No. 58 also stipulated that no former Prisoner of War would be allowed to embark by ship or air for the Zone of Interior without presenting his ID card. The procedure called for ex-PWs to be provided with the necessary first-aid immediately upon liberation. It called for the RAMPs to have their bodies, clothing, and personal baggage disinfected by spraying. The latter was to be accompanied by a brief medical inspection to determine if the former Prisoners of War were free of all infectious diseases and ready to be moved. A triage was also required in order to separate the Prisoners into those to be evacuated through medical (litter patients or ex-PWs who had been hospitalized in PW camp hospitals –ed) or non-medical channels (all ambulatory cases who did not require immediate hospitalization –ed). It was further specified that all former PWs be given a thorough physical examination at the earliest practicable moment (including medical history, x-rays, urinalysis, blood test, lab tests, and diagnostic aids as deemed appropriate –ed). Particular attention was to be given to the psychiatric condition with focus on: depression, resentment, guilt, apathy, attitude to authority, anxiety, self-confidence, health concerns, and domestic trouble. Ex-Prisoners of War classified as patients were those who required further medical treatment at Debarkation Hospitals in the Zone of Interior. Those classified as non-patients were those who did not require additional hospitalization. The procedure specified that non-patient PWs would receive the appropriate immunizations before transfer to the United States. 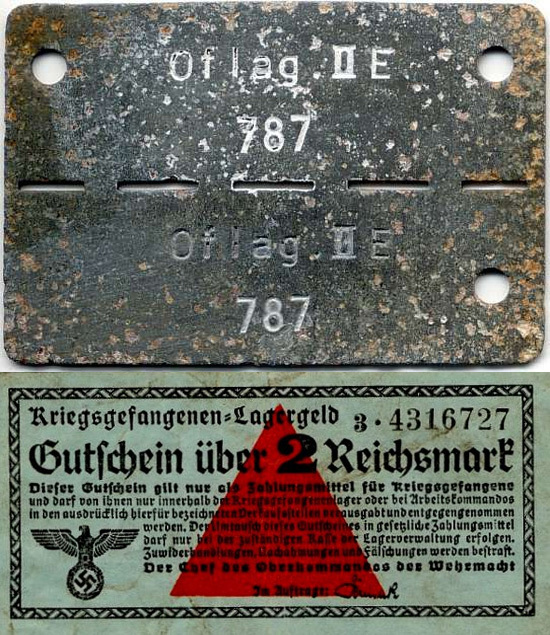 Top > Sample of a Prisoner of War Identification Tag, indicating the Kriegsgefangenenlager (PW camp) and the bearer’s PW Serial Number (787). Oflag II-E, Neubrandenburg held large numbers of Allied Officers captured in Western Europe, the Mediterranean region, and Eastern Europe. Bottom > Sample illustrating Kriegsgefangenen Lagergeld (PW Enclosure Currency). This particular note, worth 2 Reichsmark, could be used by inmates of the PW camp and/or members of the Arbeitskommandos (PW Labor Details) for individual purchases. “WD Prisoner of War Regulation, dated April 21, 1945” – outlined the administrative procedures to be followed by the military authorities between the time the ex-PWs first returned to the United States and the time when they were finally discharged or reassigned. This instruction required all former Prisoners of War who did not need further medical care to report to “Reception Centers” near their homes. Those former PWs requiring medical treatment were supposed to report to Reception Centers after receiving the necessary medical care at the Debarkation Hospitals. At the Reception Stations, former PW intelligence and casualty reporting was to be completed. In this regard ex-PWs were directed to sign a statement agreeing not to divulge any security information to parties outside the military. They were also requested to complete forms identifying and reporting on any of their comrades who they believed died or became disabled in captivity. They also were to complete questionnaires on any atrocities they had witnessed during internment (intended for use in German War Crimes Trials –ed). Another form was to be completed by each ex-PW on his service history, to be used as the basis for consideration of promotion, which was granted on an individual, case by case, for both Officers and Enlisted Men. Other functions to be performed at the Reception Stations were the award of any decoration and final payment of all salaries to which PWs had become entitled during their internment. After processing, the WD procedure provided former Prisoners of War with up to 60 days leave for recuperation and recovery, which could be extended if necessary. At the end of this period PWs were to report to Redistribution Stations were the administrative records needed for discharge or reassignment were to be completed. Ex-PWs were also advised of their right to make any claims for personal property lost or confiscated during their internment period. 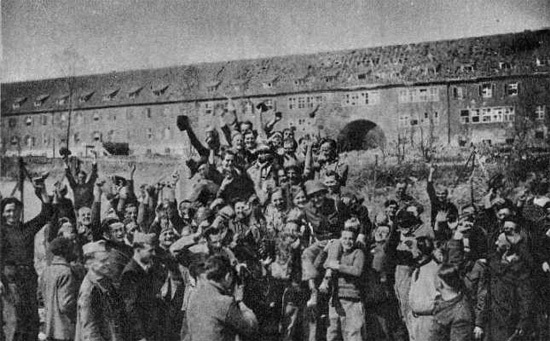 The few Prisoners of War repatriated prior to the end of the war were primarily evaders (those who had been fortunate enough to avoid imprisonment by the enemy –ed) and escapees (those who had successfully escaped, filtering thru belligerent, neutral, and/or occupied countries in an attempt to rejoin their parent organizations –ed) from German prison camps who had managed to find their way out of enemy territory, aided by members of the ‘resistance’ movements in the occupied countries. These individuals (mostly USAAF personnel –ed) were initially evacuated to London and processed in a small hotel situated 63, Brook Street, London, operated by the Theater Provost Marshal, United Kingdom, and later to Paris, France, where from March 9, 1945 onward, the Hotel “Francia”, was the place where they underwent intelligence interrogation by Allied Headquarters. After their intelligence processing, they were reassigned. Almost all American PWs were evacuated from their prison camps during the closing months of the war in Europe, i.e. April through June of 1945. Before V-E Day, the Allies interpreted the ‘Standfast’ Agreement with the German military authorities to mean that PWs recovered in camps overrun were to remain in place under the command of their already appointed leaders (should Germany have surrendered before its territory was invaded, the camps could have been emptied with German assistance –ed). 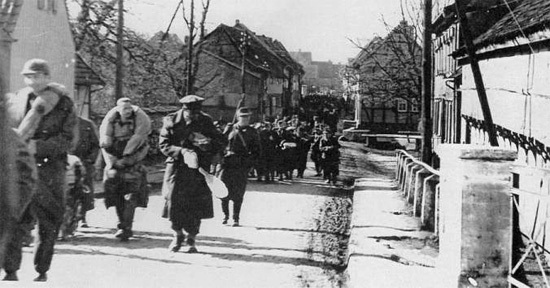 The reason for this policy was to allow the Western Allies enough time to prepare for an orderly evacuation (after Allied Forces entered German territory, it became known that as the enemy retreated they took their PWs with them, moving the camps and/or the inmates to areas between the Allies advancing from both east and west – hence there was no time to wait for a proper evacuation, furthermore because of the Soviet advance from the east, overrunning many of the camps, it became more and more difficult to retrieve and access the American Prisoners of War, causing additional hardships on the prisoners –ed). SHAEF estimated as of March 1, 1945, that Soviet Forces could be expected to uncover approximately 134,000 British and American PWs and about 425,000 PWs of other nations. After V-E Day, the ‘Standfast’ Agreement was understood to mean evacuation from the forward area as soon as possible (designated to be arranged by air, a program known as “CATOR” and issued April 4, 1945 –ed). Reception Camps to handle the inflow of RAMPs were established at Reims (although Sedan was initially selected, it soon closed and was replaced by Reims –ed) and Epinal, France; Namur, Belgium; and Borghorst, Germany. The primary Staging Area for recovered and repatriated American Prisoners of War was RAMP Camp 1, located at Camp Lucky Strike (one of the Cigarette camps –ed), near the Embarkation Port of Le Havre, France. During March 1945, large numbers of Americans RAMPs liberated by Soviet Forces and evacuated through Odessa, were shipped from Europe to the Zone of Interior, requiring opening of Camp Wings (another Cigarette camp –ed) and nearby airstrip in the vicinity of Le Havre on April 7, 1945. The Prisoner of War Executive Branch, G-1 Division, SHAEF (known as “PWX”) prepared a “Detailed Plan for the Care and Evacuation of American and British Prisoners of War after the Cessation of Hostilities”, and later issued periodic reports trying to identify and update the location of the different PW camps and numbers of Allied prisoners. Most of the American Prisoners of War recovered at the end of World War 2, were liberated by American Forces and were evacuated through US Reception Camps and Staging Areas. The remainder of these RAMPs were evacuated by the Soviet, British, or other Allied Forces. These ex-PWs were subsequently transferred to American camps (not always as expeditiously as expected –ed). US Forces, in turn, returned British and Soviet RAMPs they recovered to their respective Armies (it must be underlined that Soviet authorities proved not as cooperative as the Allies, as Soviet Liaison Officers were accredited to SHAEF with adequate facilities and access to all camps, whereas the Soviets refused to let American Contact and Liaison Officers into Poland and parts of Germany controlled by their forces, although both countries had signed the “Leipzig Agreement”, dated May 28, 1945, stipulating the “Plan for the Delivery through Army Lines of Prisoners of War and Civilians Liberated by the Armies and Allied Forces” (an agreement between the United States, the British Government and the Soviet Union concerning the repatriation of PWs had already been signed at Yalta on February 11, 1945 –ed). Allied PWs celebrate their liberation. Picture taken at Stalag VII-A, Moosburg (Isar), Germany. At one given period, this PW Enclosure held over 80,000 prisoners. Shipment of healthy ex-American Prisoners of War liberated from the European Theater of Operations ended June 26, 1945, although there were still 3,400 former PWs in hospitals. Early July, only 114 remained hospitalized. The official end of repatriation of RAMPs took place on October 1, 1945. Once back stateside, former PWs were processed as efficiently as possible, as the goal of administrative disposition was to return them to civilian life as soon as possible! With the liberation of France in September 1944, the possibility of recovering Allied Prisoners of War in overrun German camps became real, and administrative plans were made to take care of them. The Provost Marshal instituted a RAMP (Recovered Allied Military Personnel) Division on December 18, 1944. Unfortunately, planning did not include the Nutrition Branch of the Professional Services Division, Office of the Chief Surgeon, ETOUSA. The SHAEF policy with respect to RAMPs as outlined in Paragraph 555 (b) of the “Handbook for Military Government in Germany Prior to Defeat or Surrender”, dated December 1-20, 1944, was somewhat unrealistic in its approach to this problem. Allied PWs, according to the Handbook, were to be “freed from confinement and placed under military control or restriction, as may be appropriate pending further disposition”. In the early days of the war, under the conditions disclosed by escapees and evaders, this procedure might well have worked. However, Americans who were captured during the Battle of the Bulge (December 1944 –ed) related that they had been continuously on the march with hardly any rest and with totally inadequate nourishment, until well inside Germany. Obviously, these men, and others on the march, had suffered great hardships from which the Geneva Convention had not, as expected, protected them. Hence, it was virtually impossible to leave them where they were when the camps were overrun. On May 7, 1945, the SHAEF Supreme Commander decided that all American and British ex-Prisoners of War should be evacuated from the Army areas in the shortest possible time, regardless of any limiting circumstances. “CATOR” (Combined Air Transport Operations Room –ed), the agency that controlled air transportation, was given as its first concern the movement of the RAMPs to installations in the Communications Zone. Before this decision, the movement of supplies had priority with CATOR, and the Prisoners of War were to be evacuated wherever camps were located close enough to the delivery points for supplies. This change in policy greatly accelerated evacuation of liberated Prisoners through administrative channels, and from a daily rate of approximately 1,500 the number jumped to 30,000 on May 9, 1945. Recognized medical cases were evacuated separately. By April 22, 1945, reception camps for the handling of American and British RAMPs were established at Namur, Belgium, and at Reims and Epinal, France (Epinal later became RAMP Camp 2 –ed). Partial view of an Air Evacuation Holding Unit in Germany. ADSEC evacuation plans included the opening of combined units in order to rapidly receive casualties not flown directly to the United Kingdom or France, but proceeding through such holding units. Hospitalization units from either Field or General Hospitals combined with Medical Gas Treatment Battalion elements, were set up to provide shelter, food, medical and emergency care for a large and rapid turnover of patients. Casualties received at first were mostly sick and wounded from Army units, but later included large numbers of Recovered Allied Military Personnel (RAMP). Camp Lucky Strike (one of the Cigarette camps –ed), situated near St. Valéry-en-Caux on the north coast of France, had already been designated as a transit camp. Camp Wings (another Cigarette camp –ed), close by Lucky Strike, served as the air terminus for the men evacuated by air and also as a base camp for British RAMPs. Eventually, an additional airstrip was built at Camp Lucky Strike to relieve the load at Camp Wings. Evacuation from the temporary camps became a sizeable problem, as rail and air facilities were loaded to capacity. The Chief Surgeon made 29 Hospital Trains available to the Theater Provost Marshal to help the administrative evacuation. Camp Lucky Strike (designated RAMP Camp 1 –ed) was selected as the installation that would have the greatest part of the work involved in the processing and evacuation of RAMPs because of its proximity to the port of Le Havre and because it had a capacity expandable to 70,000. Approximately 60,000 Americans were listed as Prisoners of War in the hands of the Germans, but actually over 94,000 RAMPs were in fact evacuated through medical (approximately 11,680 –ed) and administrative channels (approximately 82,320 –ed). These discrepant figures are accounted for by the many thousands previously listed as Missing in Action. 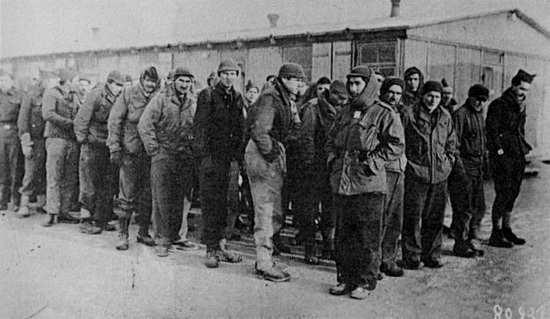 Camp Lucky Strike, situated in the Northern District of the Normandy Base Section, was set up as the major reception area for RAMPs being sent through command, as distinguished from medical channels. Camp Lucky Strike had originally been intended as a Staging Area for incoming ground force personnel during hostilities, and much had to be done to adapt it for its new purpose (at the end of the war, most camps were used for redeployment and/or return of troops stateside –ed). The camp proper was divided into four blocks, with a total capacity of about 40,000 soldiers. Block D was set aside originally as the RAMP Camp and, in a short time, was made an independent command responsible directly to the Northern District. Block C was set up as a possible 306th General Hospital facility to take care of convalescent RAMPs. The former PWs were flown in from the forward areas to the airport at Le Havre (Y-30 airfield Le Havre/Octeville –ed) where a 2,000-bed tent setup was made available. All RAMPs were screened medically at the airport by Physicians of the 98th Medical Battalion and by the Dispensary Officers from Le Havre units under the direction of the Northern District Surgeon. Those few who arrived by rail transport were sorted several hours out of Le Havre, and complete triage was effected before the train arrived at the station. Of approximately 7,000 RAMPs evacuated to Le Havre for the Camp Lucky Strike area in the early days, 824 were hospitalized. Of the total number arriving, there were about 2,400 British personnel, who were kept in Camp Wings for several hours and then transshipped to the United Kingdom, except those who, being too ill, were first transferred to American hospitals for additional treatment. Of the entire number hospitalized immediate triage at the landing field accounted for 390 men. Of these, the sickest were taken directly to the 28th Station Hospital, at Yvetot, France, about 30 miles from the airstrip; while the remainder were sent to the 179th General Hospital at Rouen, France. EM 46, G.I. Roundtable Series: Our Russian Ally. Illustration of a War Department pamphlet published 20 January 1945 and used to provide Information/Education Officers with material to conduct group discussions or forums on specific subjects. 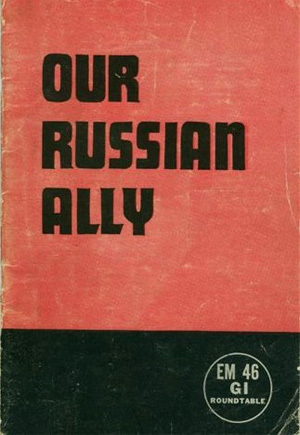 Such publications were prepared by the Historical Service Board, American Historical Association, and could be obtained from the United States Armed Forces Institute (USAFI). The first batches of returning men were met as they alighted from the plane by the American Red Cross people, who provided hot coffee, donuts, peanuts, and a wool blanket. Transportation thence to the Camp was by the usual 2 ½-ton Army 6 x 6 trucks (16 to 18 men per truckload). Here, they were again screened by the Dispensary Physician of the post assisted by Medical Officers of the General Hospitals staging in the areas. Up to Friday evening, April 13, 1945, 4,400 men actually reached Camp Lucky Strike. Of these, 425 were hospitalized by the screening Physicians on admission and at morning sick call at the Dispensaries. They were admitted to the 77th Field Hospital set up on the campsite. On Saturday morning, April 14, 1945, the 77th Field Hospital had a patient census of 441. It may be recalled that all these men had been previously screened in forward areas, where RAMPs were divided into those to be evacuated by medical or by command (non-medical) channels. Those sent to Camp Lucky Strike area had been considered physically fit and ready to be returned home. Forward triage was of course difficult at best, and subsequently many things could go wrong. The trip by air, sometimes through great turbulence, was often enough to upset these men, whose balance was precarious at best. Then followed the warm but nutritionally unsound welcome by the American Red Cross personnel, which in fact, were secondarily responsible for many cases. Germany April-May 1945. 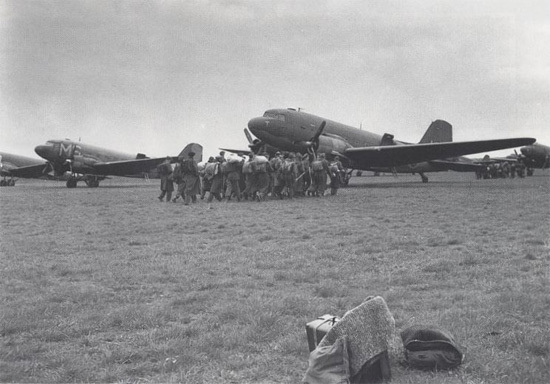 Allied RAMPs are boarding C-47 aircraft bound for France, one of the stages of their evacuation to freedom. The Dispensary setup at Camp Lucky Strike was very adequate. There were 3 such medical installations, each serving 10 detachments of 200 men each, served by two to four Physicians in each Dispensary. On Saturday morning, April 14, 1945, sick call reached over 500 RAMPs, despite the fact that the population of the camp that morning had fallen to 2,800 men, owing to the evacuation of 1,500 RAMPs to the Zone of Interior during the night. About 80% of the men reporting on sick call suffered from gastro-intestinal disturbances; the rest, predominantly had acute infections of the upper respiratory tract, pyodermia, and other skin conditions. Numerous patients had complaints relating to polyneuritis, hyperesthesia, paresthesia, muscle atrophies, edema, and cheilosis. These were seen as additional complications of the gastro-intestinal symptoms. The histories reveal that many of the acute respiratory infections started in transit. Acute gastro-intestinal symptoms also started in transit and at the RAMP Camp. It was known that the initial delousing was not always completed before arrival at Camp Lucky Strike. It is to be noted parenthetically that many RAMPs were found to have originated from Stalag XII-A where 22 cases of typhus fever in the Russian prisoners had been reported. Among the 441 patients in the 77th Field Hospital on the morning of April 14, the commonest diagnoses were gastro-enteritis complicating malnutrition, acute infections of the upper respiratory tract with malnutrition, and pyodermias with malnutrition. Three percent of all RAMPs admitted required intravenous plasma therapy as an immediate supportive measure. As anticipated, the patients tolerated intravenous fluids very, very poorly. Two units of plasma were the most given in one day. No whole blood was available. Vitamin supplies were very poor at that time and were not used as extensively as might have been desired, but supplies did arrive very shortly afterward. There was a rather acute shortage also of paregoric, bismuth, and belladonna. In the first group of patients admitted, X-rays of the chest were taken; the diagnosis of pneumonia was made in 7 out of 55, and 1 case of active tuberculosis was found. The 28th Station Hospital located nearby had admitted 57 RAMPs. One death occurred shortly after arrival. The autopsy protocol revealed a bronchial pneumonia complicating malnutrition. The serum proteins had been estimated before this soldier’s death as 2.5 gm. per 100 cc. The Medical Consultant at the Normandy Base Section, Lt. Colonel Theodore L. Badger, MC, invited the Nutrition Consultant from the Office of The Chief Surgeon to give orientation talks to the Chiefs of Medical Services of the hospitals in the Northern District of the Normandy Base. As a result of these conferences, certain recommendations were made, based in large part upon observations made on recovered prisoners in forward areas. Briefly, the first proposal was that a system of two messes be set up in the RAMP reception area, with one to serve a bland diet ration to all newcomers for at least 48 hours, and optionally after that. At Camp Lucky Strike, this was feasible and acceptable to the administration and to the district Surgeon. It was felt that much hospitalization could be prevented and convalescence sped up by an early general diet therapy for reeducation of the gastro-intestinal tract. The second recommendation was to give the RAMPs short orientation talks on proper eating as far forward as possible. A poster system for the mess halls was devised as a visual aid to this educational campaign. One of the most important recommendations was that every effort be made to stop the American Red Cross and the Army Exchange System (PX) from flooding these men with donuts, candy, apples, and peanuts. One soldier ate 17 donuts on his trip back from the forward areas with results that can be imagined. It was recognized that the acute vitamin deficiency syndromes were precipitated only after full feeding had started and so could not be anticipated, but preventive therapy should have been started earlier. Medical Officers needed to be oriented with respect to therapy of severe chronic malnutrition. Directives were issued by the Office of The Chief Surgeon on advice from the Medical Consultant to the Nutrition Branch. These were basically concerned with: avoidance of intravenous therapy, the use of bland soft diets, and the avoidance of such medications as iron. Many Physicians, when they found the deficiency anemias, immediately prescribed iron by mouth, but this therapy was not considered rational in the presence of such great protein deficiencies. Also, qualities of the iron compounds irritating to the gastro-intestinal tract precipitated secondary problems. Medical Officers were further warned about details of treatment of complicating infections. Extra vitamins would be required in the febrile period. The early use of penicillin in adequate dosage was to be encouraged. The use of the sulfonamides was to be considered on a very cautious basis because (1) they upset the gastro-intestinal tract, and (2) the hemoconcentration, dehydration, and scanty urines called for much smaller doses on account of the minimal excretion and the possibility of precipitation in the genito-urinary tract. Illustration of a RAMP Registration Form identifiying an ex-Prisoner of War (in this particular case a USAAF NCO) and listing his personal data. A further recommendation was that the evacuation policy from the Communications Zone to the Zone of Interior be modified. It was found that the RAMPs, from 3 to 5 days after arriving from forward areas, were put on transports with no provision for special feeding. It was felt that the rough voyage would start nausea and vomiting in a large percentage of these debilitated people, resulting in unnecessary hazards to quick convalescence and possibly even endangering life itself. Furthermore, some of the men being less than 15 days away from known typhus areas might possibly be carrying the disease during the incubating phase. The diphtheria rate also was high among the former Prisoners of War and their rapid evacuation to the States risked carrying virulent diphtheria home quickly. Transport commanders were accordingly informed by “Medical Bulletin No. 1”, dated May 15, 1945, that various degrees of malnutrition had been found in the Recovered Allied Military Personnel (a Surgeon’s Bulletin, drafted May 6, 1945 had already been distributed among RAMPs with the appropriate heading: “Take The Doctor’s Advice” –ed). Although marked improvement had been accomplished under a rigidly controlled diet program, complete rehabilitation would necessitate several more weeks of nutritional management. Accordingly, this program should be continued both aboard ship and aircraft and in the Zone of Interior. Foodstuffs to be restricted included particularly donuts, peanuts, citrus fruits, cauliflower, cabbage, the concentrated components of C and K-rations, and high fat-containing foods. The general mess should be on a soft or bland diet both before and during the voyage home. The Medical Bulletin outlined in detail the various precautions that had been taken to protect the RAMPs from gastro-intestinal disturbances, which in so many cases were cause for hospitalization. Incorporating the essential recommendations just discussed, “Circular Letter No. 36, Office of The Chief Surgeon, ETOUSA”, was published on April 19, 1945. On April 28, 1945, with the cooperation of The Chief Surgeon and the Chief Quartermaster, the special bland diet menu was issued, and copies of the menu were distributed by the Adjutant General, ETOUSA, with instructions that the special menu was to be used as a basis for feeding recovered malnourished US and British Army personnel until the normal field ration A menu could be tolerated. Statistics gathered from medical units at the various RAMP Camps reiterated the need for taking such action and showed prompt results. In one camp, where the operational 10-in-1 ration was fed on an emergency basis to 1,000 recovered prisoners, 150 were hospitalized after the first meal for acute diarrhea, and a number of others reported for sick call with various gastric complaints. At another camp, there was an average daily sick call of over 20% on ordinary Army rations, with 80% of the patients presenting complaints characteristic of enteritis. One week after the introduction of the bland diet, the sick call rate dropped to 4.0% with only 15% of the complaints related to enteritis and with no instances of nausea and vomiting. By 10 May 1945, Camp Lucky Strike had become very well organized. Reception into the RAMP Camp was in a designated area with a capacity of about 2,000 beds. The men were kept here for about 1 day after which they were transferred to the processing areas for a minimum of from 1½ to 2 days. The capacity of the latter was 4,000 beds. After processing, they proceeded to the “pending shipment” area for a minimum of 1 day (in actual experience from 3½ to 10 days –ed). Each of these designated areas had a different mess. The special bland ration was used by all three except that mess no. 1, in the reception area, eliminated dried fruits. In addition, there was a supplementary issue of one multivitamin capsule for each man at each meal. Between meals, a nutritional bar was available for all personnel. On May 7, 1945, this bar served 460 gallons of eggnog, 320 gallons of cocoa, 452 gallons of malted milk, and 128 gallons of tomato juice. The average serving was approximately 12 ounces. In addition, the RAMPs reaching the camp after the evening meal were served 160 gallons of dehydrated pea soup and 1,400 cheese sandwiches made with white bread. Although no control was maintained at the nutrition bar for second helpings, the length of the line was a deterring factor. In the mess, effective control was exercised by characteristically colored and marked cards issued by the tent commander to the men in formation before each meal and surrendered as they passed through the gate to the mess. It was estimated that the average consumption was well over 5,000 calories per man/per day. Inquiries made among the RAMPs and administrative personnel revealed excellent acceptance of the bland menu by the soldiers. Plate waste, as one would expect, was negligible. The messes were now in excellent condition; concrete floorings for serving and mess tents were completed; ranges and utensils were supplied by the Quartermaster General without further delay and in adequate quantities. A certain lack of communications remained, however, and the post was frequently not ready for new shipments as they arrived. After the RAMPs went through the first two areas, they were sent, as stated previously, to the holding or “pending shipment” area. 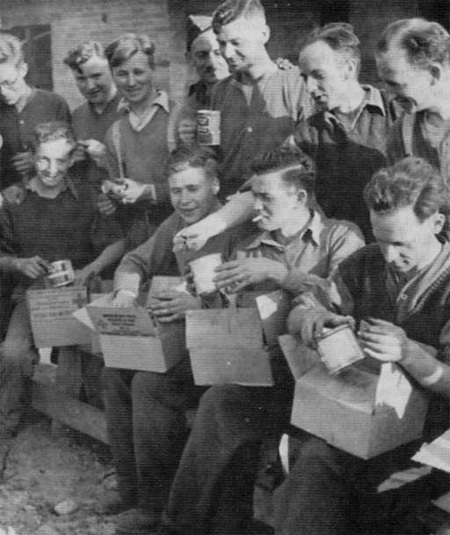 Here, the modified type A-ration was served. This holding area was no longer under the control of the RAMP Camp, having been returned to the control of the Lucky Strike Post. By the middle of May 1945, the general health of the RAMPs had much improved. The sick call rate had dropped to an average of 60 to 75 patients per day in an area whose population varied from 1,500 to 2,800 men, as contrasted with the earlier rate of 200 for a population of 2,000. The chief complaints at this time were boils, skin infections, cellulitis, and diarrhea; gastro-intestinal symptoms now accounted for only 1.8% of the total. Nausea and vomiting were no longer complaints. Infections of the upper respiratory tract were only a minor problem. Triage was still done at Camp Wings located about 43 miles from the RAMP Camp. Hospital admissions were made directly from the triage area, and by mid-May the rate was only about 10% of the incoming RAMPs. Earlier hospitalizations were over 20%, before the initial problems with the American Red Cross had been solved. The common causes for hospital admission at this time were acute respiratory infections (about 50%), diarrhea, cellulitis, and edema; while 36 cases of hepatitis were picked up in one week. The 77th Field Hospital continued to be busy through the middle of May and on the morning of May 9, 1945, it had a census of over 300 patients. Causes for admission were essentially the same as before, except that in the routine X-ray films six patients with active tuberculosis had been detected. The nutritional deficiency syndromes remained essentially as noted earlier. Problems of hospital care were greatly eased by the decrease to the vanishing point, from over 80%, one month previously, in the number of patients with nausea and vomiting complaints. 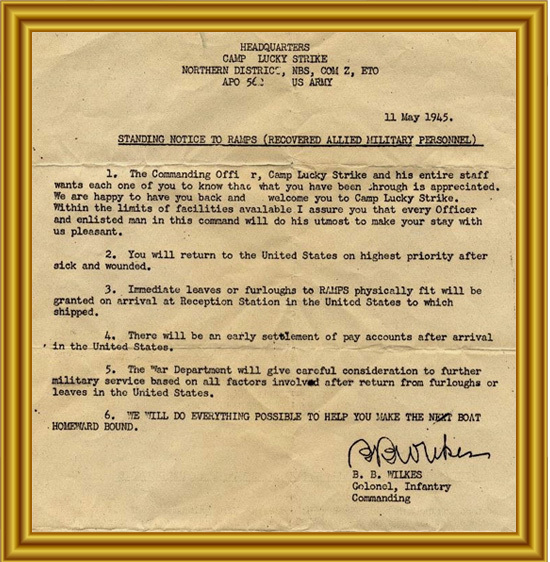 Copy of Letter dated 11 May 1945, received by every RAMP upon arrival at RAMP Camp # 1 – “Lucky Strike”. It was a kind of general welcome written by Colonel B. B. Wilkes, CO Camp Lucky Strike, Northern District, Normandy Base Section, Communications Zone, European Theater of Operations, APO 562. Under the Yalta Agreement (signed February 11, 1945 –ed), all Soviet, United States and British citizens liberated by the Military Forces were to be segregated from enemy Prisoners of War until an exchange at mutually agreed places was possible. The military authorities of both sides were required to notify the other as to the location and number of liberated citizens, and repatriation representatives of the Allies and the Soviets had the right of immediate access to camps or collection points. Liberated Soviet, US and British citizens were to be supplied with adequate food, clothing, housing, medical attention, and transportation until returned to their own authorities (for citizens, read: including PWs –ed) . Amidst the unprecedented disorganization left in the wake of the Wehrmacht’s westward retreat, tens of thousands of military personnel and civilians came under the jurisdiction of the Soviet Red Army as it advanced westward toward Berlin, Germany. Among these people were refugees, Displaced Persons, Allied soldiers, and PWs imprisoned in German camps and enclosures. Numbers of combat losses, Prisoners of War, and RAMPs, often differ as per sources consulted, some caution is therefore recommended (the Department of the Army Final Report, published June 1, 1953 lists 124,079 military personnel captured and interned – 21,593 Officers and 102,486 EM – of which 73,759 in the European Theater of Operations). An undetermined number of American Prisoners of War liberated by Soviet Forces during WW2 from German PW camps were not repatriated to the United States military authorities or otherwise accounted for by the Soviets. Mention is often made of approximately 23,000 who were found in Soviet-occupied territory or in Soviet custody following World War 2 (this became a crucial issue after the war linked to the emergence of the cold war).